Editor’s note: I’m an early riser, so it wasn’t hard to wake up and watch the Royal Wedding. We’ve visited Windsor Castle, so I recognized the setting. Well done! “Prince Harry and Meghan Markle have been proclaimed husband and wife by the Archbishop of Canterbury in a ceremony that is being watched by hundreds of millions of people around the world,” as London’s Daily Telegraph is reporting. “The couple – the new Duke and Duchess of Sussex – have tied the knot at St George’s Chapel in Windsor Castle. They will now delight tens of thousands of well-wishers as they travel through the town in an open-topped carriage. “Ms Markle’s white wedding dress – with a white veil and boat neck – was created by British designer Clare Waight Keller, the first female Artistic Director at French fashion house Givenchy. Prince Harry and his best man the Duke of Cambridge are both wearing the frockcoat uniform of the Blues and Royals. “A host of celebrities including Oprah Winfrey, George Clooney and David Beckham are among the 600 invited guests alongside senior members of the Royal family. Another 2,640 members of the public have been chosen to watch the ceremony from the grounds of Windsor Castle. 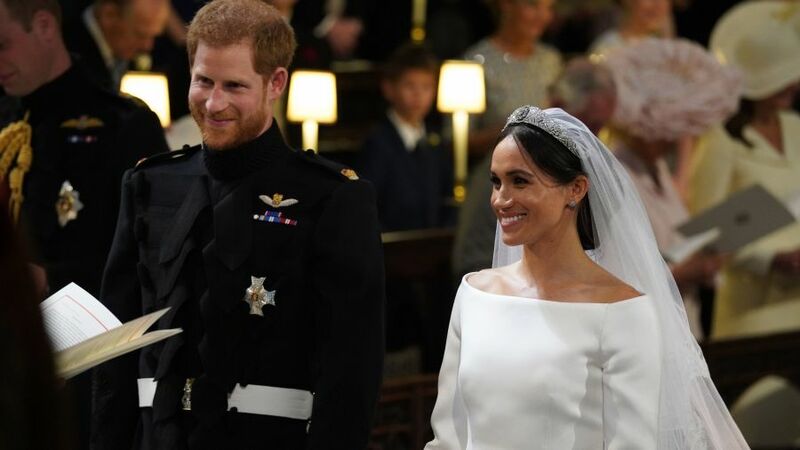 “A thousand-year-old English castle echoed with the exhortations of an African-American bishop and a gospel choir on Saturday, as Prince Harry wed Meghan Markle, an American actress, nudging the British royal family into a new era. Early Saturday morning, BBC Three pointed out the size of the crowd that amassed to see Prince Harry marry former actress Meghan Markle. The network compared it to the crowd size at President Trump’s inauguration, which, more than a year later, remains a seemingly bottomless well of jokes.